Steven Isserlis: Bach Suites, Pt. II @ St Hilda’s College (13.02.16) | WhatsTheScene? He has the perfect cello, the perfect bow, and the perfect music. 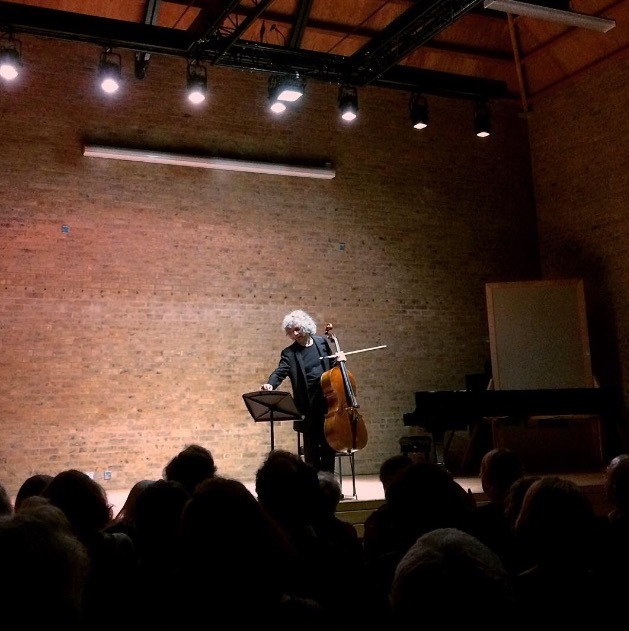 It’s the dream formula, so what could give acclaimed cellist Steven Isserlis such deep trepidation? Bach’s Six Unaccompanied Cello Suites are to a musician what Hamlet is to an actor. They are the pinnacle of art and endurance, and the ultimate test of technique, strength and musicianship. Bach’s minimal performance markings leave much to interpretation, but with such artistic freedom comes great pressure. The language of the Suites can be told a thousand times in a thousand ways, and the permutations of interpretation and dialect are infinite. Lifetimes are spent drawing out each voice and personality within the dance movements. Fashions develop, tastes shift and interpretations evolve. Minds are constantly changing. To many the Suites are the purest music ever written. There’s no work more inspiring, or more terrifyingly exposed. As the lone medium, only you can go wrong, and there’s nowhere to hide. To top it off, there’s a very real risk of physical and mental exhaustion. No wonder Isserlis has held off the performance for a decade. Thankfully musical fitness comes with the territory of a professional soloist, although the programme was still wisely split across two performances. Last night saw the Jacqueline du Pré Building of St Hilda’s College fill in anticipation of the concluding-half. The courageous cellist entered boldly, and settled alone under the lights. Isserlis brimmed with the passion and enthusiasm that he’s famed for. His animated movements mirrored the music’s dialogue: smiling, dancing and crumpling with its contours. Each movement, be it Sarabande, Bouree or Gavotte, demands effortless fluidity, whilst often being incredibly awkward to navigate. This was no problem for Isserlis’ stunning technique, but delicacy and precision were at times sacrificed for speed. Overall however, the broad strokes of his approach painted the larger musical picture beautifully. In celebration of his friend Gyorgy Kurtág’s 90th birthday, Isserlis interspersed the programme with short pieces by the Hungarian composer. Like Bach, they hold tonality strongly at their core, but differ refreshingly in style. Striking but unobtrusive, they added new depths of field to the familiar format of the masterpieces. In discussing the Suites (see below), Isserlis remarked that “my task is to let the music flow through me unhindered”, “we have to let the beauty through, as a window lets through light”. True to his word, his approach was as illuminative as it was humble. The meditative simplicity of the opening D minor Prelude (2nd suite) set this modest precedent. Instead of the customary embellishing of its final chords, Isserlis chose a pure, untouched sound, presenting the harmonies’ beauty without distraction. Crucially, it was not a performance of Isserlis playing Bach, but rather of Bach played by Isserlis. He was his charismatic self, but served as vessel with total selflessness. Even his encore (Catalonian folk tune ‘Song for the Birds’) threw the spotlight elsewhere. With this ode to Casals, the cellist who brought the Suites fame, Isserlis rounded off a remarkable performance. The last word came not from the man, but his cello, which with a helping hand, took the final bow.